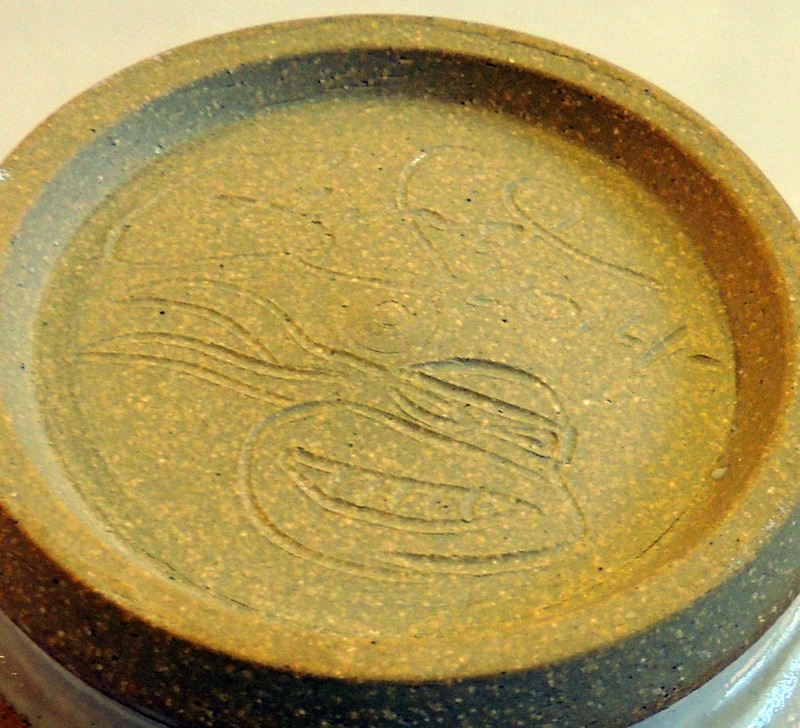 In May of 2012, after a roughly forty-year hiatus, I returned to an art form with which I'd had a brief but passionate encounter as an undergraduate: pottery. 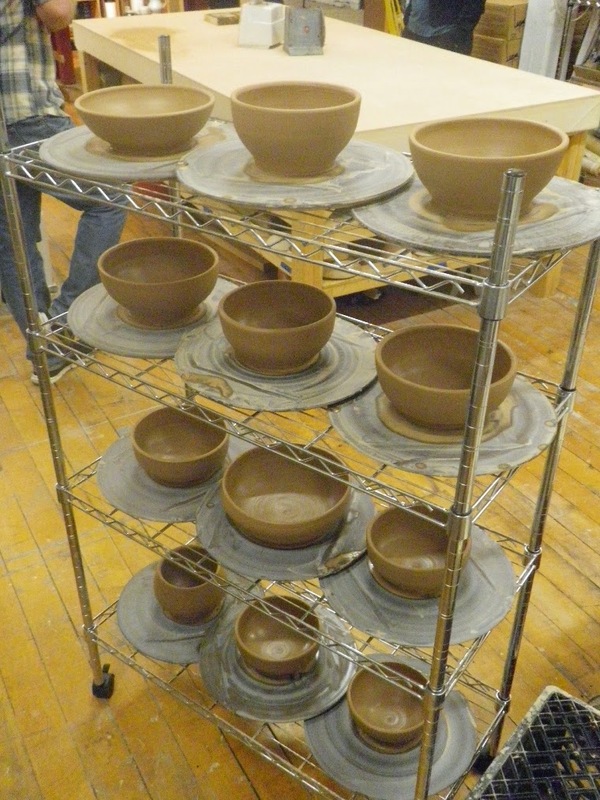 I only took one semester of "Ceramics 1" at the University of Massachusetts in Amherst back in 1974, but I loved it -- especially working on the wheel, throwing bowls and mugs and goblets. So why did I wait forty years before taking it up again? Long story. 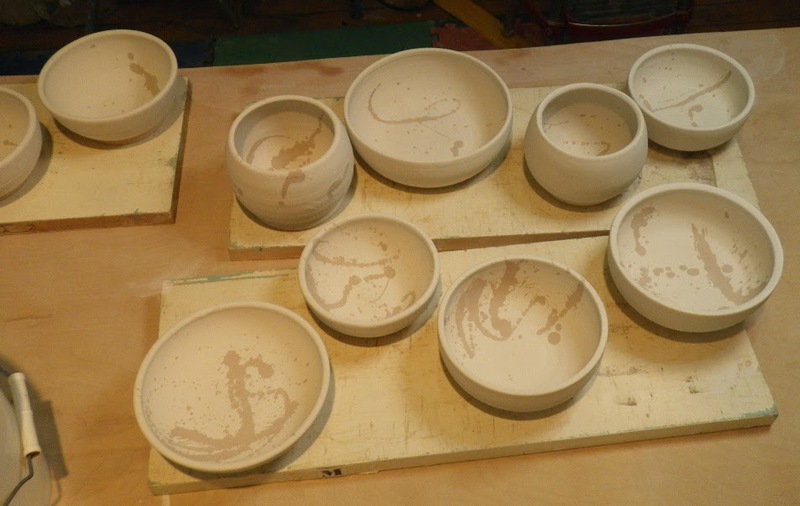 Two and a half years ago I began taking private lessons and then classes with local "practical potter" TIffany Hilton, who proved to be a wonderful teacher. I have continued to study with her and in fact will be taking another of her classes soon. 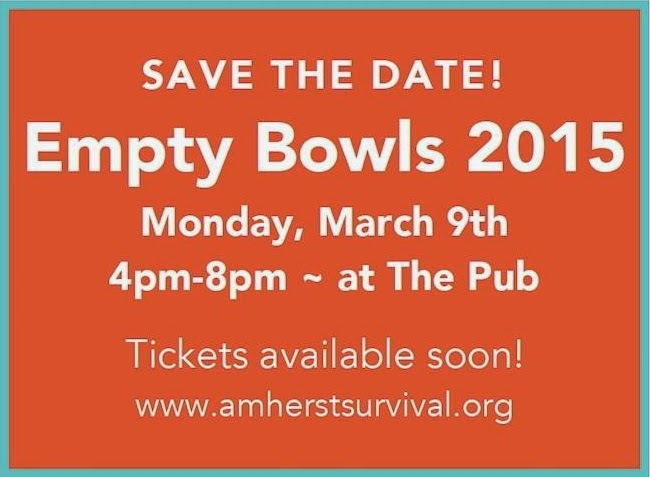 Last year, when I was finishing up a class with her, TIffany surprised me by asking if I would be interested in making some bowls for an upcoming charity event called "Empty Bowls" being put on by the Amherst Survival Center on March 9, 2015. The way it works (as I understand it) is that local potters make and donate ceramic bowls, and local restaurants donate food, and for the price of an admission ticket (proceeds going to the charity), patrons can choose one of the bowls and get it filled with food, taking the bowl home with them after the meal is over. ... I dipped them in one glaze, adding a few brushstrokes and spatters with a second glaze. 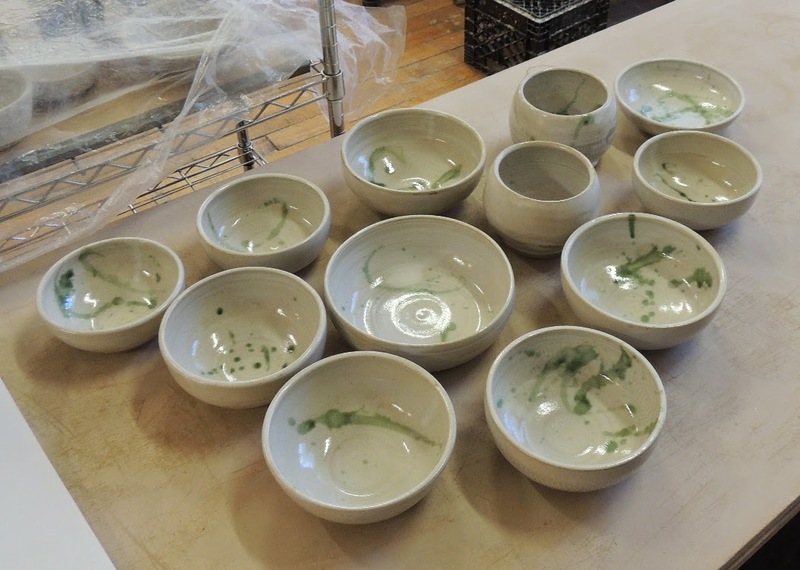 A few days ago, TIffany told me that she'd done the final firing, and I could come and view my bowls before they went off to their final fate. 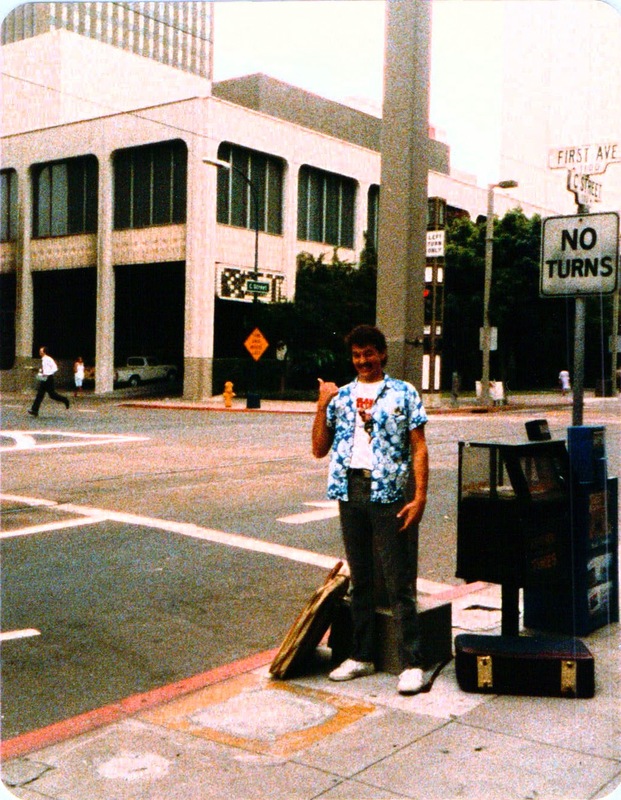 "Now we're back [from the 1987 San Diego Comic-Con -- PL] and back into the day-to-day grind. Right now, I'm working on completing the art for TMNT $12, which I am doing all by myself. I don't know if I told you about this, but Kevin and I have decided upon a new way of doing the turtle books. After three and a half years of intense collaborative effort, where each bit of story we would work on together and have to agree to, we need a change. So now, we will be alternating books -- I'll do #12, Kevin will do #13, and so on. It's kind of exciting, but at the same time scary, because we've each depended on the other for so long. I'm about a third of the way done with #12 right now, but I'm pretty sure that I'll be able to finish it in time for the scheduled September 30 ship date. Another (hopefully) minor problem is with the animation company, Murakami/Wolf, which is doing the turtles cartoon. We just got the last set of storyboards last Monday, for episode five, in which the disembodied brain character, Krang, gets a robot body built for him by the Shredder. The problem is that the design of the robot body as shown in the storyboards was absolutely dorky -- it resembled a sick Pillsbury dough-boy. When we called Karl at Playmates about it, he said that it shouldn't be a problem -- that the actual animated robot body would look different, as it is common practice for the storyboard artists to do quick roughs for the purposes of the storyboards. Fine and good… until Karl called us again last Friday and told us that Murakami/Wolf said that they were too far into the production of the fifth episode to change the look of the character. This we found hard to believe, and it was pretty strange because the procedure through the last four sets of storyboards is that we would get concept sketches of any new characters along with the boards, and be able to change whatever needed changing. So we told Karl that we wouldn't approve it, and we called Mark Freedman, and he called Karl, and etc. etc…. the upshot being that I think today (Monday) we'l be talking with Karl again to see what we can do about solving the problem." [I still remember where Kevin and I were when we had the discussion which resulted in our doing separate issues -- we were sitting in Pulaski Park in Northampton, near the Academy of Music, on a sunny, warm day. It was unnerving doing a whole issue of the TMNT comic (except for the lettering) by myself, but ultimately it was fun, and liberating, in a way. Still, all things considered, I think I would have preferred that Kevin and I had kept working in our traditional collaborative style. I never did another full issue of a TMNT comic by myself. 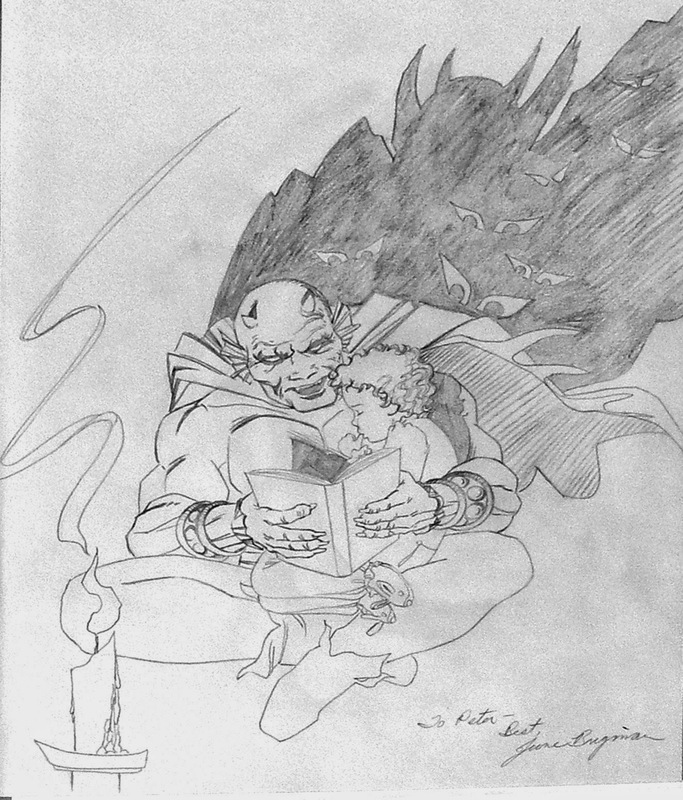 I have great respect for people who can do issue after issue of a comic book series -- it's a lot of hard work. But we were under a lot of pressure, mostly related to the rapid expansion of Turtle business, and that way of working together just wasn't feasible anymore. We never really had that level of collaboration again, and I missed it. I still do. 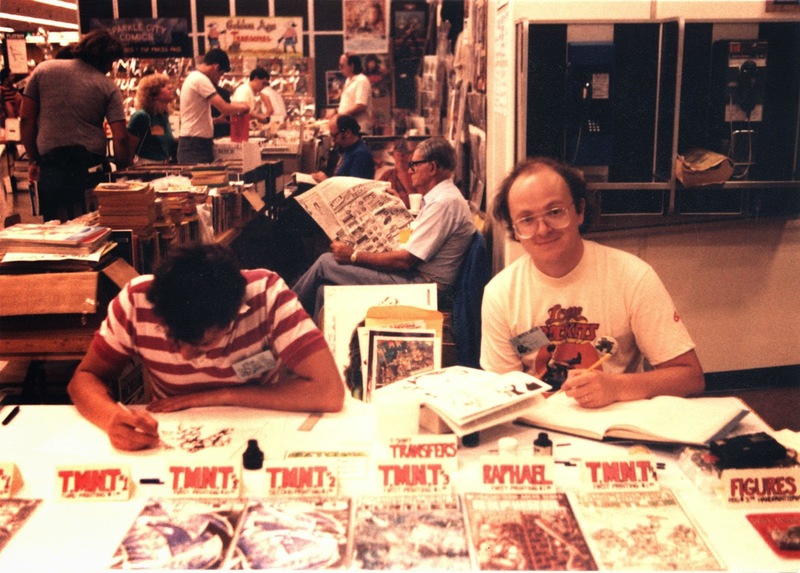 But I treasure the memories of working with Kevin on those early TMNT books -- it was a unique experience. Contrary to what I said in the first paragraph above, Kevin did not do issue #13 after my issue #12 -- issue #13 ended up being a Mike Dooney book. I can't recall why, exactly, that shift occurred, but I suspect it must have had something to do with the press of business and personal life disrupting Kevin's ability to make the deadline for publication of that issue. The "minor problem" with the animation studio doing the new Turtle cartoon was, in retrospect, a harbinger of problems to come. As anyone familiar with that first TMNT animated series is aware, the stupid design for Krang's robot body never got changed. If we had been more on top of things, and been more willing to risk doing stuff that might have delayed -- or even canceled -- the animated series, it might have turned out differently. But this was all new to us, and we really wanted this stuff to happen, and we let a lot of things slide, this included. We were also focused on the comic books Mirage was doing at the time, and didn't have a lot of energy to devote to the animated series... and, truth be told, as could be intuited by the fact that Kevin and I had decided to stop collaborating on the comics, we were not as in synch as we could have been, and did not present the united front which might have made dealing with other business people significantly easier. As my brother Bruce might say, "It is what it is." What happened, happened. I can't go back and change it now, as much as I wish I could. "Greetings from the East! Yesterday I picked up the new issue of Usagi Yojimbo, but i didn't read it 'til today. I gotta tell you, Stan -- I was impressed! You already know I like your stuff a lot, but this book was great! You're really developing the character of Usagi in a fascinating manner… the gradual exposure of his history is tantalizing to say the least. And I love his tense friendship with the rhino ronin. Reading this book today got me so worked up that I had to do something… so I sat down at the drawing table and roughed out this eight-page story featuring Usagi and Leonardo. It's based around an incident lifted form the Robin Hood legend -- how Robin met (and befriended) Friar Tuck. I'm sending you copies of the roughs (and believe me, they are rough! ); I hope you can follow the story. I'd really like to get your OK to finish this, maybe as a backup for your book or one of ours. Please let me know what you think… any suggestions would be appreciated. I can't remember the last time that a book inspired me to such immediate (drawing) action… thanks muchly for Usagi Yojimbo!" 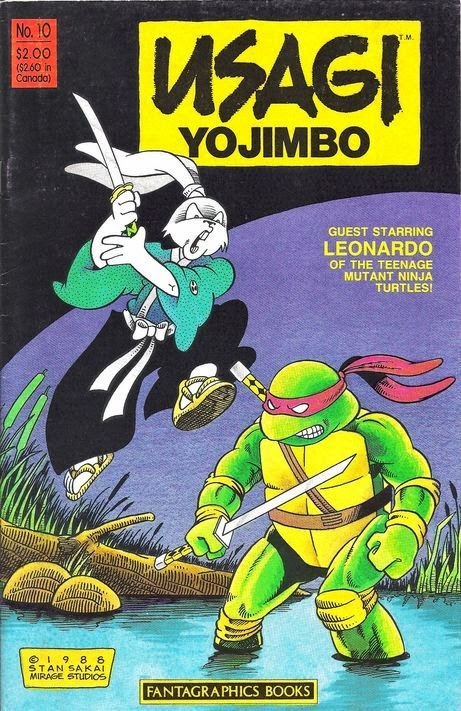 [TMNT fans may recall the short comic book story which came out of the idea of mine mentioned here -- "The Crossing", which I believe appeared in "Usagi Yojimbo" #10. I wrote and drew that one by myself, on Duo-Shade board. Steve Lavigne lettered it. "Guess where I'm going to be on my birthday? Give up? California! Yes, the trip to meet with the Playmates people is now scheduled for the week after next. We'll be leaving on the 27th, meeting on the 28th and 29th, and coming back on the 30th. I'm not really looking forward to it -- I'd much rather be home on my birthday, and regardless of my birthday, I don't like to be away from Jen that long. I just have to look at it as an irritating necessity of my business life, I guess. I'm enclosing a couple of books that I don't think you have yet -- Leonardo #1 and Gobbledygook #1. Gotta keep your collection of Mirage Studios pubs up to date, right?" [I think this was the very first visit Kevin and I made to Playmates Toys at their headquarters in La Mirada. Mark Freedman of Surge Licensing joined us out there. We met two of the major players working on the TMNT toy line at that initial meeting -- John Handy and Karl Aaronian. Given what was to follow, which of course I could not fully envision at that point, it's a little amusing to see me describing this trip as an "irritating necessity of my business life"... which, I suppose, at that point it was. Taking four days out of our schedules when we were going great guns with the comics and struggling to keep up with our self-imposed deadlines probably did seem annoying at that time. And I really didn't like being away from my wife for that long. It's funny -- during the time between the date of my last entry in these "Snippets", which was from June 7, 1986, and this one roughly seven months later in January of 1987, a lot of really important stuff happened -- we moved from Connecticut to Massachusetts, set up actual office space for Mirage Studios, lost one secretary/office manager, then hired another... and probably most significant, we got contacted out of the blue by Mark Freedman, met with him in Northampton and signed a deal for him to be the licensing agent for the TMNT property. I can't say for certain, because the dates are a little fuzzy in my brain, but it's also possible that both Jim Lawson and Mike Dooney moved to the Northampton area from Connecticut and New Jersey, respectively, during this period. I really wish I'd written more of this stuff down when it was happening. If memory serves, for some reason I ended up coming back by myself from sunny, warm California, and found my car covered in more than a foot of snow... which I had to dig it out of, with no shovel, in the unplowed parking lot at the airport. Not a pleasant experience. At least by this time I had a reliable new Honda which I would not worry about so much in terms of starting when I needed it to and having an actual working heater for the cold months. "I'm really sorry to have been such a bum about writing letters… it's just that I have been so freaking' busy! I won't bore you with the details, as I'm sure you heard enough about it in my video letter. Suffice it to say that while we feel great about finally finishing TMNT #7 (three weeks late, but what the heck), we are still under the gun with our next book to finish by the end of May, along with all the artwork for the second turtle role-playing game. So for the next few months, we'll still be insanely busy. C'est la vie! The weather here has been beautiful lately, except for one bizarre day last week. It just happened to be the very day that we had to drive out to Poughkeepsie to deliver the artwork for TMNT #7 to the printer. Well, that morning it was snowing! I mean, the day before had been sunny and warm, almost 70… and here it was, snow, blowing all over the place! On the way out to Poughkeepsie, it actually turned into a small blizzard, and the driving was pretty hellish, all the way out and all the way back. I thought that we might be in for a relapse of winter, but the very next day it was hot and sunny and all the snow had disappeared. Who can figure…? Kevin and I are getting ready to leave for FLorida tomorrow, for a two-day convention in Fort Lauderdale. We'll be coming back next Tuesday, probably in a sunburned state. Should be fun!" 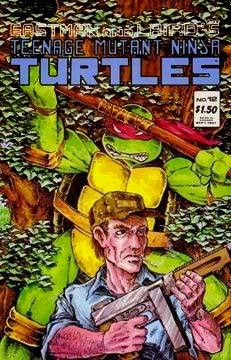 [Fans knowledgeable of TMNT history may realize that the Fort Lauderdale convention mentioned in the last paragraph was the one out of which came the "Turtlemania" collectible -- a small fanzine-type publication featuring a variety of TMNT art. Its various iterations have gone on to demand high prices as collectibles over the years since… I'm not entirely sure why. I recall that this show was small, held in a medium-sized function room at a hotel, and that Kevin and I came to refer to it as the "Relaxi-Con", due to the very low traffic and light crowds. I remember it was so dead at times that some of the dealers were playing cards with each other to alleviate the boredom. This was our "day off", and we had a lot of fun. First we all went to eat breakfast at the Executive again, and who should be sitting there at another table but Roz and Jack Kirby. I considered going over to say hello again, but decided that I should let them eat their breakfast in peace. After breakfast, we took Alison's car to Balboa Park, which houses lots of attractions including the Museum of Natural History and the San Diego Zoo. The Museum was where Monica Sharp and Dave Garcia had told us there would be a dinosaur exhibit, so I was really psyched to see that first. The exhibit was on the second floor of the museum, and it was great! I was in seventh heaven. 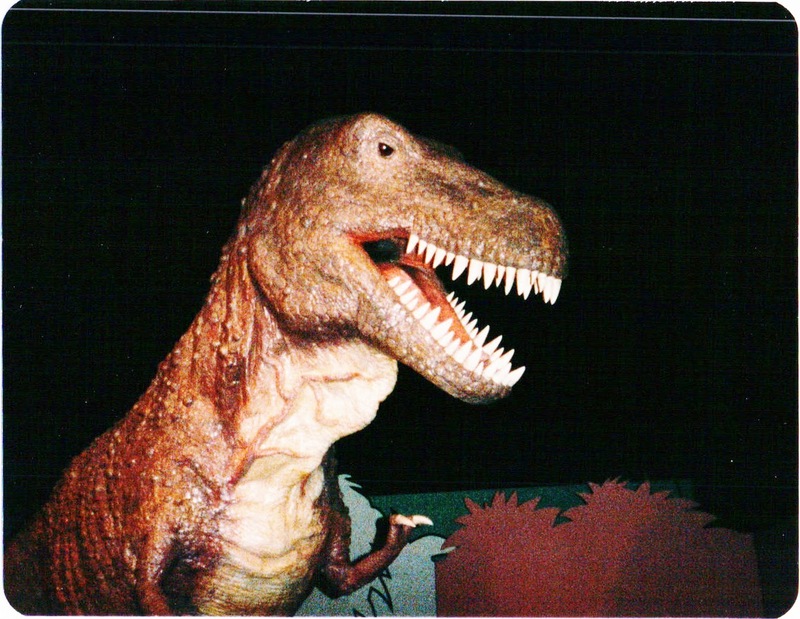 That had these near life-size replicas of five dinosaurs -- Stegosaurus, Triceratops, Tyrannosaurus Rex, Brontosaurus, and Trachodon -- and one prehistoric mammal, the wooly mammoth. The modeling of these beasts was superb -- they were done in painted latex rubber -- but what was neat was that they were all constructed with computer-controlled motor-driven armatures which made them move around and make animal noises! It was quite something -- the best one, oddly enough, was the Brontosaurus, which didn't make very dramatic moves or noises like the Tyrannosaurus Rex… but it had a way of snaking its long neck (surmounted by its tiny head) over towards you, and kind of looking you in the eye and cocking its head just so and opening its mouth and roaring… Well, you had to be there, I guess. Of course, you can't have a museum like that without a gift shop, and they had two -- the regular one and one set up specially for the dinosaur exhibit. I went crazy in that one -- Kevin said later that he came in and found me wandering about with glassy eyes, stuffing dinosauria into a little shopping basket. I think I spent a total of about $150 on dinosaur stuff there, including t-shirts with dinosaurs on them, dinosaur tie-clips, pins, etc.. That whole museum excursion made my day. 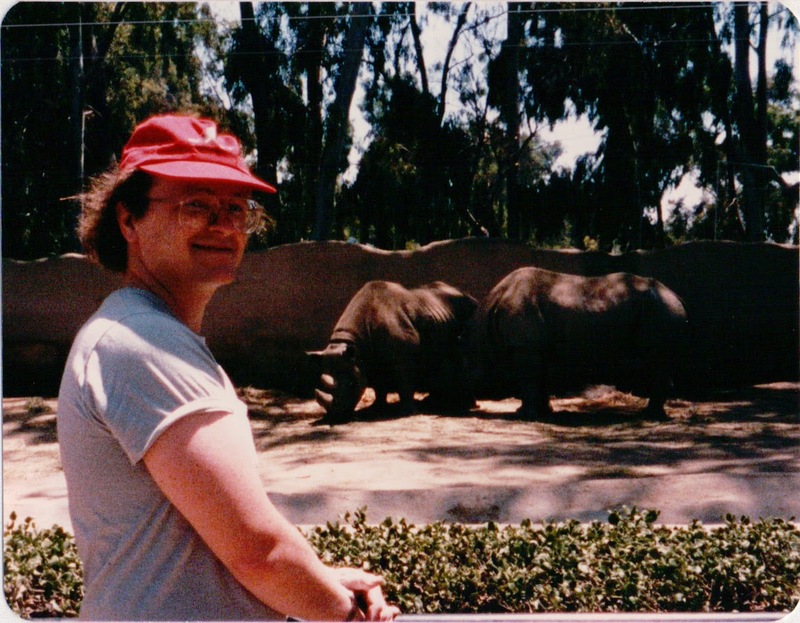 After that, we strolled over to the San Diego Zoo, and took the cable car ride over the length of the zoo (much too short a ride, though the zoo is pretty wide), then got off it and walked around. All the animal exhibits there are open to the sky, and there were some neat animals -- though how that shaggy musk ox took the heat, I don't know. A lot of the nocturnal animals were hiding in their enclosures (which usually had plenty of bushes and logs and stuff in them), which made them rather hard to see. We were determined to get to the beach and actually immerse ourselves in the Pacific Ocean. This took longer than it should have, due to our lack of familiarity with the local geography, but we finally made it to a beach called, cleverly, Ocean Beach. The waves were pretty big, and it was quite a kick to frolic in them. The water wasn't exactly warm, but it was hardly as cold as the water back in the New Hampshire ocean. After enjoying the beach and getting sand in everything we had carried with us, we took a cab back to our hotel (Alison had left earlier to head back to L.A.), then went out to dinner again at a Jolly Roger restaurant in the Seaport VIllage, and again stuffed ourselves. We did a little more shopping there, then wandered back to our hotel, happy as little clams. It had been a great day, and a wonderful way to end the weekend. The return trip was uneventful (and on an airplane, an uneventful ride is what you look for), and we got back into Bradley Airport in Hartford around 6:00 PM Connecticut time (we lost the three hours we had gained). The car started after five days in the parking lot (hurrah!) and it was smooth sailing all the way back to good ol' Sharon, CT. I'm really glad that we went out to the San Diego Con, and would like to do the same thing next year, but a little differently. 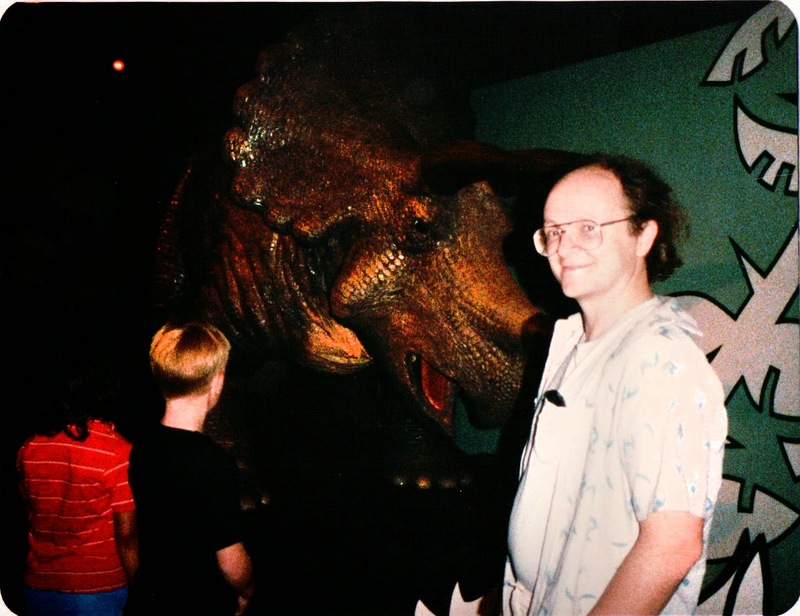 I think that next time, Kevin and I will go out by ourselves for the first three days of the convention, and"
[I do recall quite clearly my delight in seeing that dinosaur exhibit in the Museum of Natural History at Balboa Park. It was the first time I'd ever encountered those animatronic dinosaurs, which now seem to be a staple of kid-friendly dinosaur shows. But back then, it was a thrill to see these things. It really spoke to the little kid in me. The brief mention that "the car started after five days in the parking lot" might seem odd to anyone who drives a modern, reliable car... but back then, finances dictated that we drive some pretty awful old vehicles, and it was always a question if they would work properly... or at least well enough so that we were not stranded somewhere. [Note: This is the fourth part of the "group letter" which I wrote and mailed to family members and a few friends to let them know about my first trip to the San Diego Comic Con. The third day of the con, we agreed, would be our last, as we wanted to take Sunday off and look at some of the sights of San Diego.We tried to finish up all the sketches that we had on our list, but it was to no avail. In addition to the fact that there were just too many on the list, we were also starting to suffer a little bit of artist burnout from trying to draw so much so fast. We stayed at the con 'til 7:00 PM, and by that time we were really beat, mostly from trying to finish as many drawings as we could. I'm afraid we disappointed several people who ordered sketches -- we had about fourteen on our list that we just couldn't get to. At least we told them up-front that there was no guarantee that we could finish their sketches. Kev and I said our goodbyes to the various people that we had met at the convention, and trudged back to the hotel. DIane and her friend from Los Angeles, an ex-UMie named Alison, were waiting there, ready to go out and see some sights. I begged off, preferring to mellow out that night, and I think Kev would have liked to, but he was kind of stuck. I ended up taking a leisurely stroll through the Seaport VIllage, going in lots of the different shops there and eating tacos at an outdoor restaurant. It was a relaxing way to end a frenetic day. 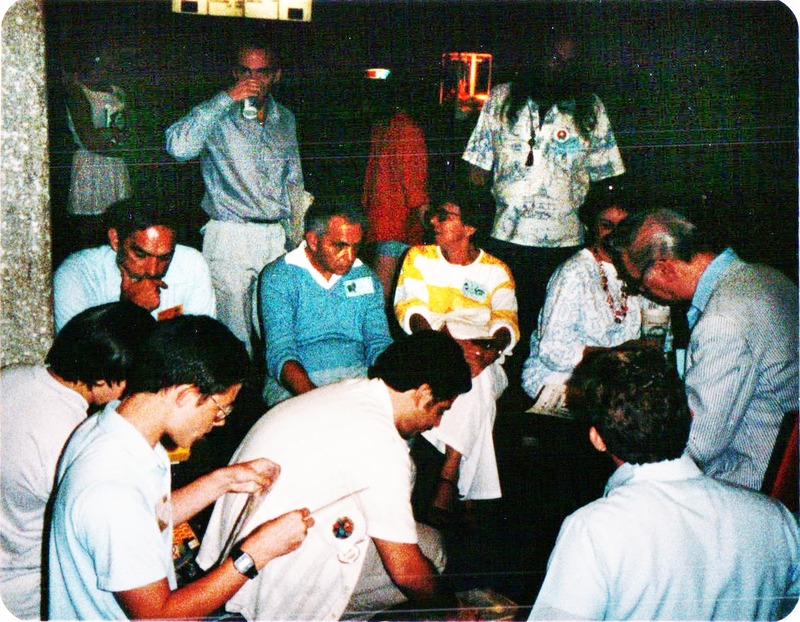 [It's quite evident that the highlight of my third day at the 1985 Comicon (maybe the highlight of the whole trip) was meeting -- albeit only briefly -- Jack Kirby. That was the icing on the cake. [Note: This is the third part of the "group letter" which I wrote and mailed to family members and a few friends to let them know about my first trip to the San Diego Comic Con. The second morning of the convention, we decided to bypass the yucky Hotel San Diego breakfast fare and go instead to the Executive Hotel up the street, which Norman had suggested as a better place to eat. It was… the breakfast was great (albeit more expensive) and we had a nice view of the city and the bay, as the restaurant was on the 9th floor of the hotel. Thus fortified, we made out way over to the convention hall at about 9:00, only to find that no one was being allowed in until 9:30, and the public at 10:00. I guess they were afraid if they let some dealers in earlier than others there might be some pilfering. (We didn't worry about that because we took everything with us when we left the con.) Finally, we were let in, and proceeded to set up and get down to work on the list of sketches that we had accumulated the previous day. It was getting pretty long… I think we had about sixteen people on the list at that point. The day went pretty much as the first day. We were kept very busy selling books, signing books, talking to fans and friends, and drawing. We also actually got a chance to look around at some of the multitudinous tables full of wonderful merchandise, though there was no way we could look at it all. I picked up a couple of really neat robot models, and a few comics. I also found a table where they were selling original art by Russ Manning from a book called Magnus, Robot Fighter which appeared in the sixties, and which was one of my favorite books and a great influence on my drawing. I bought two of these pages at $65 each, though I would have liked to have bought more. The was so much neat original art there that it's a wonder that I came home with any money at all! We left the convention that day a little earlier than the first day, because we had made reservations to take a harbor dinner cruise. So we zipped back to the hotel, got freshened up, and walked down to the dock where the boat, a cute paddlewheel job, was moored. We had a fun time on the boat -- the dinner was mediocre, but it was neat to see the sights around the harbor, and to go up on the open top deck and catch the ocean breezes. The cruise lasted about three hours, so it was getting dark by the time we returned. One really cool thing that happened was that just after sunset, we were on the top deck when we saw a bright orange and white vapor trail appear over the western horizon and rise in the sky. When it was about 45 degrees above the horizon, it suddenly stopped and then just as suddenly fanned out in a huge bright white plume of vapor or smoke, which lasted for about another two minutes, then stopped. It was really quite dramatic, and everyone was trying to guess what it was. I thought is was a missile or rocket of some sort, and found out the next day that I was right -- it was a rocket carrying upper atmosphere sensors that had been fired from Vandenburg Air Force Base." "Since you last visited (which was the last time I communicated with you), we've done two store signings and gone to Detroit for a two day convention. Not only that, but we've done two more books -- TMNT #4 and Fugitoid) the latter to see print in the first week of September). Have you got a copy of TMNT #4? I can't remember if I sent you one or not… so I'll include one with this letter. I do feel that I should at least get this short missive out to you so that you will know that I am thinking of you… and I really won't have an opportunity to write you again until next Tuesday (August 6?) which is when we will be getting back from the San Diego Comic Convention. We're leaving this Wednesday, taking a noon flight out. The con starts on Thursday and goes through Sunday. We'll be leaving on Monday morning to come back to Sharon. But you might ask why I can't write a letter between now and Wednesday… the answer to that is that we are currently working feverishly to finish the artwork for the TMNT role-playing game, which is due to hit the shelves in October. Our deadline to finish everything for that project is August 19, and it will be tight! Then, right after we finish that, we have to jump right into doing TMNT #5, which is supposed to hit the stands in the first week of November. Wish us luck!"